Fun apps for your phone aren’t the only startups that need financial support. These four companies will now have the opportunity to get funding for their ideas to change the face of energy use. It’s a rough world out there for cleantech startups. With highly publicized failures like Solyndra in the spotlight, investors are likely wary of taking on anything that isn’t a sure bet. But not all hope is lost; this week, an accelerator program focusing exclusively on cleantech launched this week in San Francisco, and it may just provide the warm, incubating environment that startups need to succeed. Dubbed Greenstart, the accelerator is the brainchild of three veteran entrepreneurs, none of them with a cleantech background, but all of them with serious networks in the investment and startup community. “Starting a company is really hard, especially as a first-time entrepreneur. We’ve all been starting companies since our early 20s. There are so many things that if had known when we were just starting, we would have made much better decisions,” says Mitch Lowe, Greenstart’s managing partner. Greenstart chose four companies out of 129 applicants to participate in its first three-month accelerator (there will be three each year), which will introduce the startups to potential investors, provide mentorship from successful entrepreneurs, offer prototyping space, assistance with grant writing and legal assistance, and help the companies identify early adopters for their services. Each startup will also receive a $25,000 to $100,000 investment from Greenstart. So how did the Greenstart founders choose the startups? “They have to expand the use of clean energy or reduce the use of dirty energy,” says Lowe. “There are a lot of interesting ideas ready to be commercialized now, that could be producing revenue now.” And in fact, some of these startups already have prototypes and a customer or two–they just need some cash and coaching to really get started. The four companies in the inaugural Greenstart class are Lono, LLC, a company that manufactures the Smartershade, a “smart glass” technology that allows different levels of light to enter based on user controls; Sylvatex, the manufacturer of a renewable diesel fuel made out of biomass-derived ingredients; Tenrehte Technologies, which is behind the PICOwatt Wi-Fi-enabled, energy-monitoring smart plug; and Wa.tt, a free energy monitoring tool that gathers and analyzes information from multiple energy accounts. they’re used to hearing. 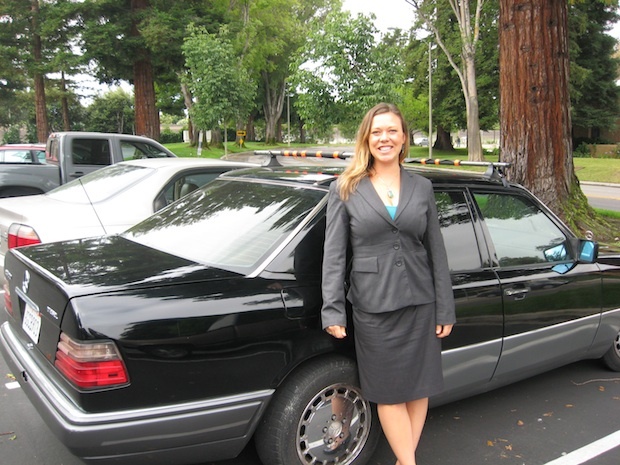 That’s where Greenstart will be valuable,” explains Sylvatex CEO Virginia Klausmeier (pictured at top with a Sylvatex-powered car). And Lono already has a two-inch by two-inch prototype and a development and manufacturing partner. “Greenstart will give us structure to make sure we’re going in the right direction,” says Lono cofounder Michael Stacy. Lowe, for his part, is confident that all of the startups are worthy of funding. “We want to unleash that wave of people who can make a difference sooner,” he says.